Several anchor stations were worked by the LOIS RACS Challenger cruises with the ship at anchor for periods of between 12 and 24 hours. The anchor station designations are of something of a mixed bag. 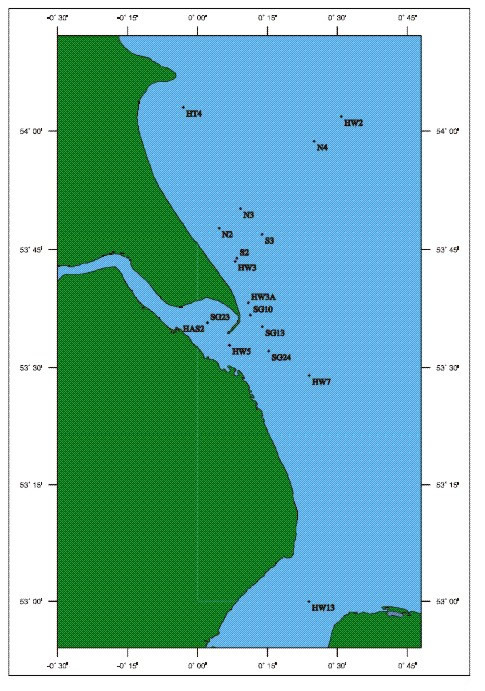 Some correspond to stations on either the Humber-Wash (HW) or Humber-Tweed (HT) grids, the N and S stations are mooring site designations for the RACS Holderness Experiment and the SG station designations were unique to Challenger cruise CH119A. HAS2, also know as SG23, is an anchor station at position 53.59°N, 0.037°E worked during the Challenger cruises CH99 and CH119A (no CTD profiles were collected during CH119A). On most cruises the ship's instruments (including nutrients) monitored the surface water from the non-toxic supply. In addition, CTD profiles were collected at regular intervals at each anchor station, however the sampling strategy varied from cruise to cruise. Typically, the minimum coverage was a CTD cast every hour with water samples taken from the rosette, however sometimes additional casts without water sampling were taken to increase the sampling frequency to every 30 minutes or even 15 minutes.